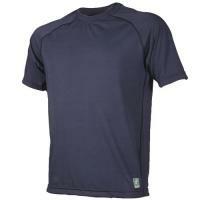 The DriRelease® T-Shirt from Tru-Spec is the ultimate warm weather base layer. The advanced cotton/polyester jersey fabric and moisture-wicking capabilities automatically regulate skin temperatures, keeping the body up to seven degrees cooler than other fibers. The addition of a FreshGuard® treatment works to naturally fight against unpleasant odors, guaranteeing lasting freshness through extended day wear. The fabric blend also dries extremely quickly, up to four times faster than cotton alone. Tru-Spec's tee is built for maximum mobility and comfort. The stretch fabric combined with a raglan sleeve construction maximize mobility, perfect for high-intensity tasks. It is even sewn together using flatlock seams and features a heat-transferred inner tag to eliminate chafing.